Put two robotics researchers in a small room with a bad tempered snake, 30 children and a zoologist. And make sure everyone learns something and enjoys themselves. That was the goal of a recent SCU-led project called ‘Robots vs Animals,’ a collaboration with Bristol Zoo Gardens education unit and Bristol Robotics Laboratory, with funding from the Royal Academy of Engineering. I’ll admit that was not how the project was originally defined, but it was the situation I found myself in as project coordinator last March. The snake was a grumpy Columbian rainbow boa called Indigo, who was supposed to be demonstrating energy efficiency in the animal kingdom. The researchers were specialists on Microbial Fuel Cells, a system that can convert organic matter into electricity. They work on highly innovative designs that get power from urine – but only a small amount at a time, hence the need for energy efficiency. The kids were 12 and 13 year olds from a local school who were learning about biomimicry and seeing the cutting edge applications of science and maths. 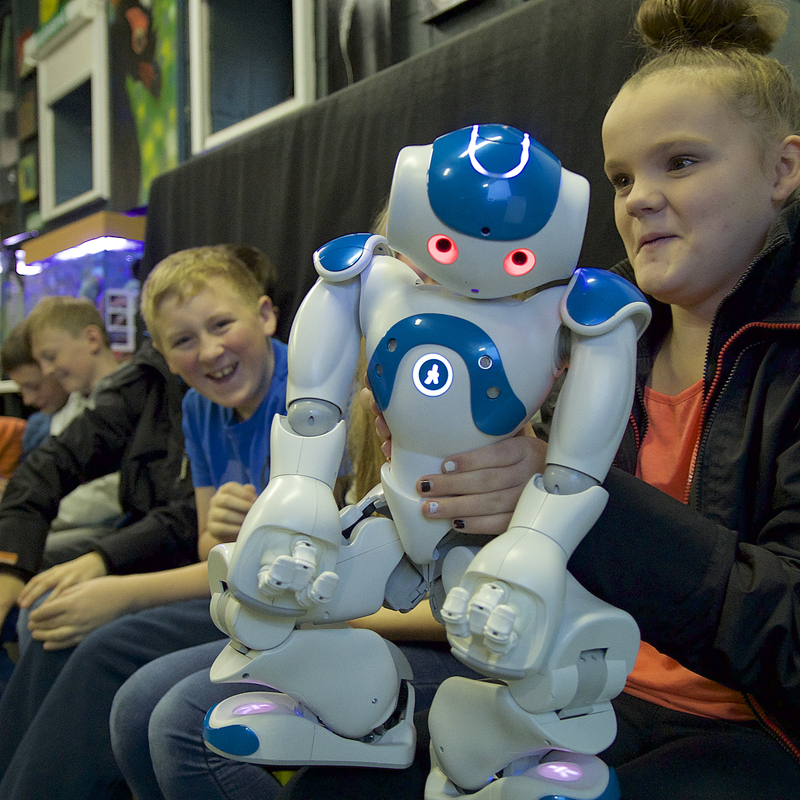 In this project I think I learnt as much about public engagement as they did about robots. I mean human, skin contact. It’s an old chestnut of engagement, but it proved itself once again. Even when bits of equipment broke – or were broken before we even started – the audiences really appreciated getting to hold and touch things themselves. This applied as much to the wires, switches and circuit boards of the robots as the cuddly and creepy animals. A ‘robot autopsy’ (bits and bobs from the scrap bin at the Lab) went down a storm in a Bristol primary school and a Pint of Science pub quiz. Watching school students handle a Nao robot as carefully as a baby was a project highlight for me and featured strongly in their positive feedback. I was physically based in the Bristol Robotics Laboratory for the duration of the project, and it made a huge difference being around the researchers outside of our meetings and in between emails. I could get a much better sense of their projects, interests and personalities by seeing them every week, even if I theoretically could have coordinated the project from the SCU offices on the other side of the campus. Being around also helped to give the project a higher profile inside a busy, hard-working research lab where time for public engagement is limited. 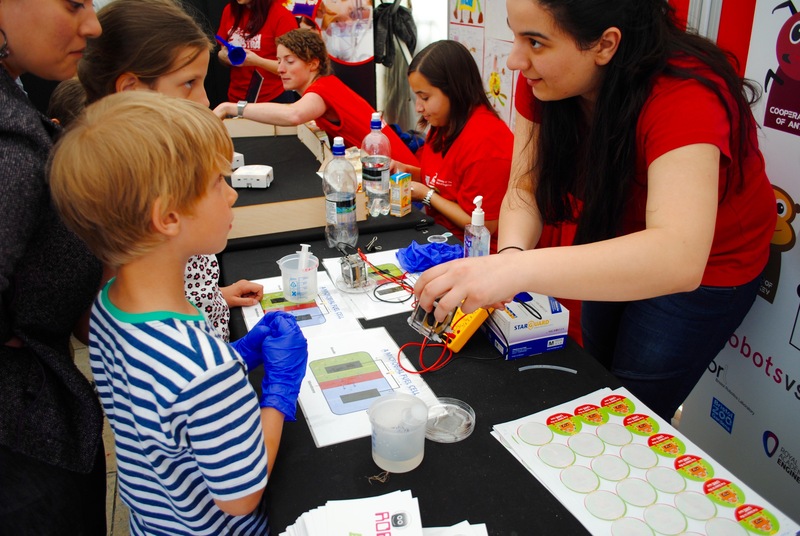 The project evolved from its main focus of classes at Bristol Zoo Gardens to include a short film with a local science centre, talks and stalls at public events and even a teacher training seminar. Being able to say ‘yes’ to opportunities as they arose from different quarters is a luxury that not all projects can afford, but I found it was important to stay open to opportunities as the project developed. Attention to how the project outputs are worded in the first place helps, so does listening carefully to the needs of participants and interested parties and having a great project manager (thanks Laura Fogg Rogers!). So how did all of that help with an irascible snake, excitable kids and nervous researchers? Firstly, Zoo staff quickly went to find a snake that would be more amenable to being stroked, to allow for first contact. I attended the session alongside the researchers even though they were leading it. This meant I could give feedback and support, and had the honour of watching as they became more skilled and relaxed. Having seen how they kept their nerve with the uncivil serpent, I knew I could rely on those researchers to handle other difficult situations – like appearing in front of a camera when the opportunity arose. Finally, when we had the chance to showcase their research at another event, we made use of our contacts and took the docile cockroaches with us rather than Indigo the snake. Corra Boushel is a project coordinator in the Science Communication Unit. Robots vs Animals was supported by the Royal Academy of Engineering Ingenious Awards. Thanks to the Science Communication Unit and Bristol Robotics Laboratory at the University of the West of England and Bristol Zoo Gardens. No snakes were harmed during this project.